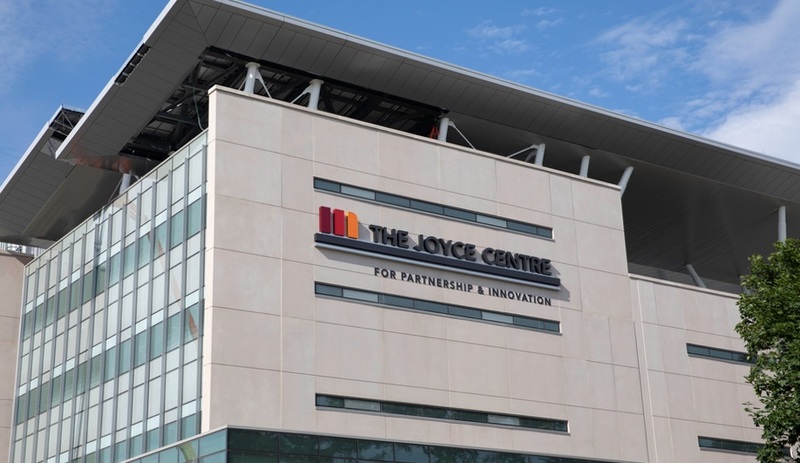 The Joyce Centre for Partnership and Innovation, at Hamilton’s Mohawk College, is Southern Ontario’s first net-zero energy institutional building. 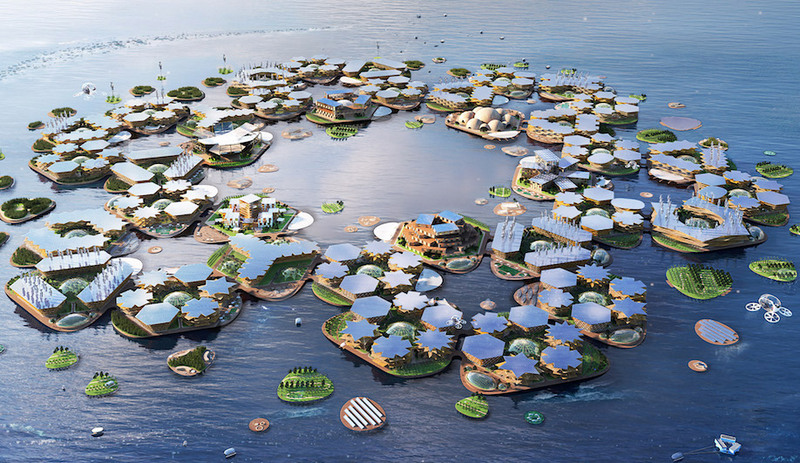 Its goal, however, isn’t simply to exist – it aims to train students to operate the sustainable buildings of tomorrow. 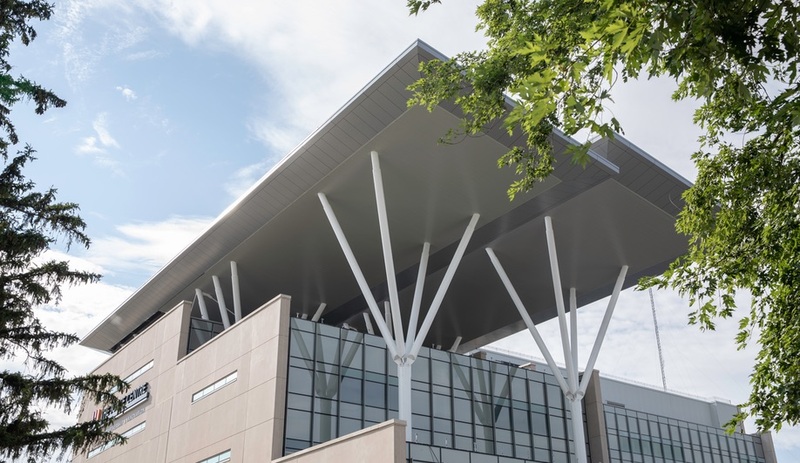 From afar, the first thing one notices about the Joyce Centre for Partnership and Innovation, located on Mohawk College’s Fennell Campus in Hamilton, is the building’s dramatic winged canopy. It’s the initial clue that this institutional building, set to open to students this fall, is different: far from a simple architectural flourish, the canopy is made from solar panels – it’s part of the college’s 1,900 photovoltaic arrays, capable of harvesting more than 721,00 kWh of clean energy. 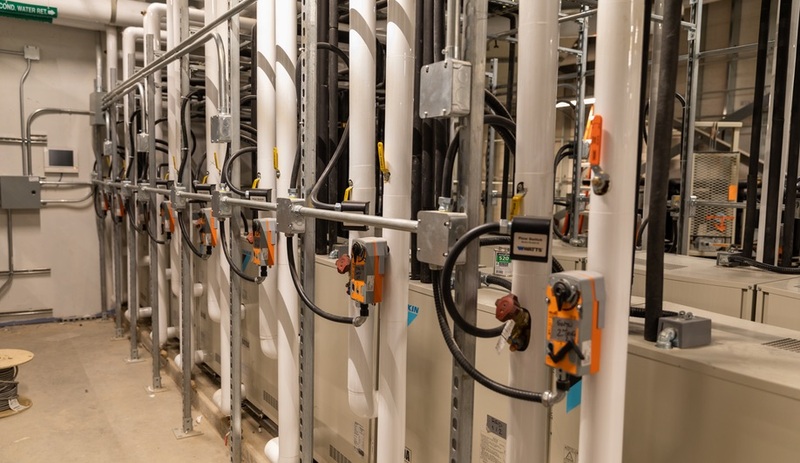 The energy produced by those panels, the college estimates, will be able to power the 9,000-square-metre, seven-storey Joyce Centre – its computers, it laboratories, its heating, its light – while producing surplus for Mohawk College’s grid. 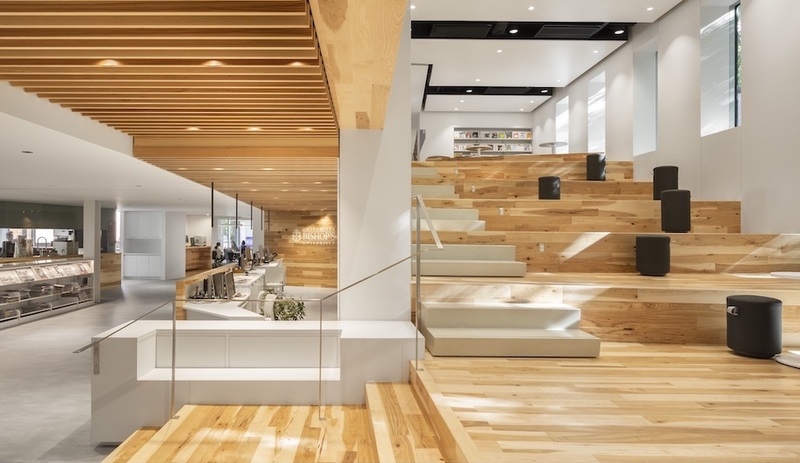 If that sounds ambitious, it’s because it is: The building, designed by Hamilton’s McCallum Sather and Toronto’s B+H Architects, is the first net-zero energy building in the region, and the largest of its kind in Canada. It’s one of 16 pilot projects selected for the Canada Green Building Council’s Zero Carbon Building Standard – and it’s a far cry from Hamilton’s hard-polluting industrial past. In designing the Joyce Centre, the project’s architects had to balance two budgets: financial and energy. Joanne McCallum, co-founder and CEO of McCallum Sather, says it leaned heavily on RDH Building Science principal Steve Kemp to develop an energy target. “McCallum Sather and B+H have been focused on sustainability as long as we’ve been in business,” she says. “But putting the right team together was critical in putting together an energy budget. When Azure listed the Joyce Centre as one of our Canadian buildings to watch, we noted that it invites students to think about energy and carbon differently – and that’s evident from the moment visitors enter its light-filled lobby. Lit by a dramatic multi-storey window wall, the open-concept gallery is flanked by 100- and 200-seat lecture halls. That’s standard college fare. What’s more unusual, though, is the row of screens mounted on a lobby wall, each displaying guages, graphs and interactive menus. 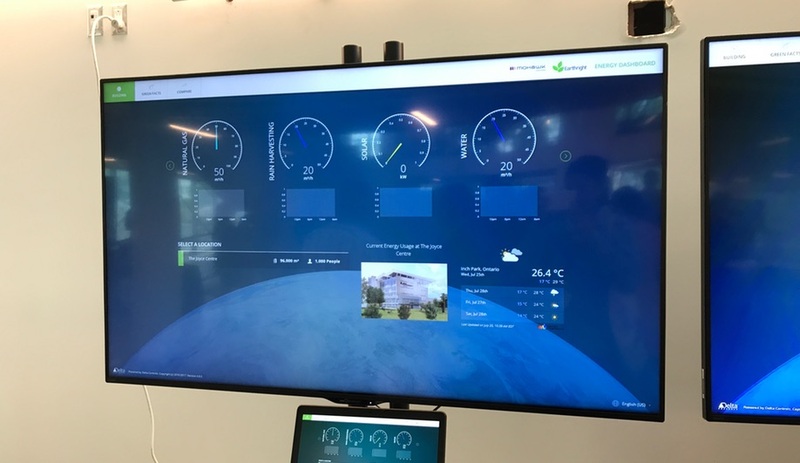 This dashboard offers a peek into the building’s vital signs: students can visualize how much power is being harvested, how much energy is being used, and the performance of the building’s geothermal system. Along with its photovoltaic canopy, the building also employs an envelope that creates an air and vapour barrier and triple-glazed windows to lighten the load on HVAC systems. “Without that envelope, hitting an energy budget would be hard to achieve,” adds McCallum. Beyond its energy budget, Lisa Bate, principal at B+H, says that the building also strives to limit its carbon footprint. 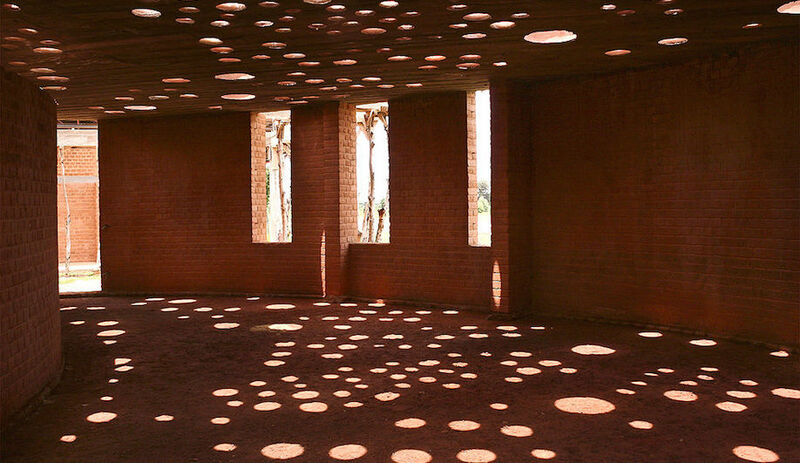 It also has storms cisterns that collect up to 228,000 of water used in high-efficiency plumbing. 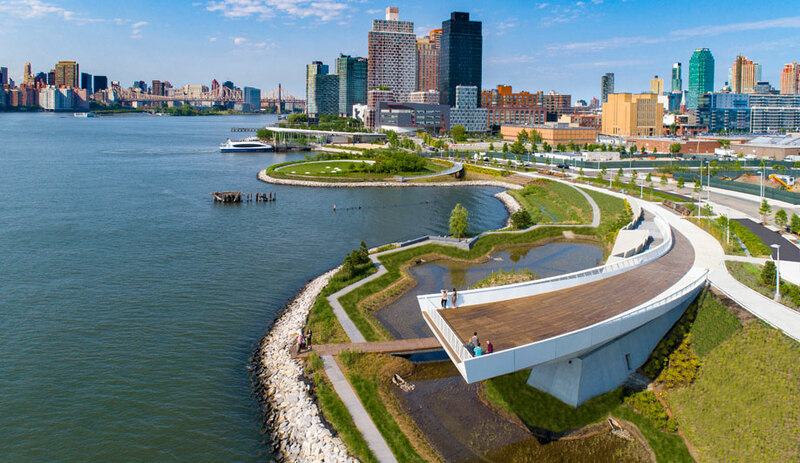 “The building was mandated to be net-zero energy… but we had a moment where we asked, ‘How far can we go?’ We have an integrated design, an incredibly engaged client and building occupants that are going to be educated,” she says. 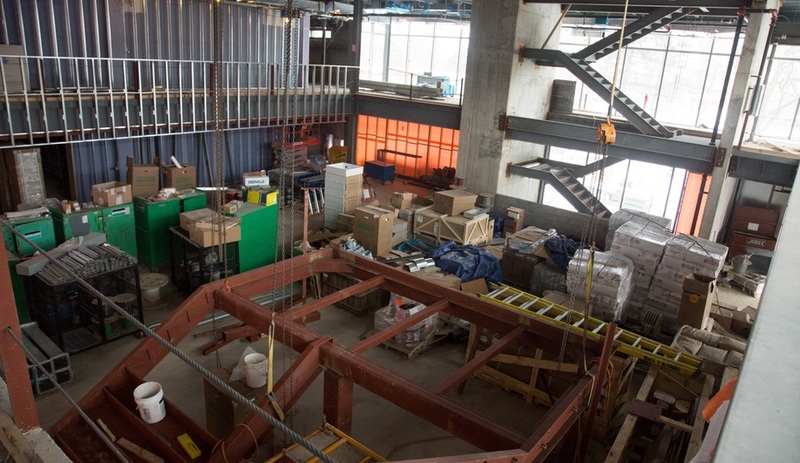 The lobby’s dashboards, however, aren’t the only way students can visualize the systems that power the Joyce Centre. Up the elevator – and above the digital creativity centre, the sustainable design lab, the energy a power management room and an array of other studios and classrooms – is the building’s geothermal heat system, filled with water-cooled pumps responsible for regulating the building’s temperature. 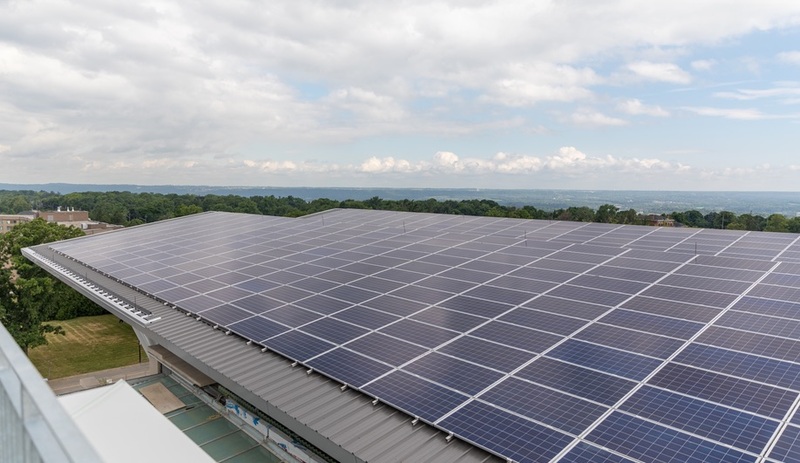 Rather than being cordoned off, this service area features heaters and air ducts that visitors can traverse before emerging onto the roof, which, below the dramatic photovoltaic panels, offers panoramic views of the Niagara Escarpment. It’s a place to examine how energy is harvested – before it’s routed to 28 geothermal wells, buried 184 metres below the Joyce Centre – or to eat lunch. The building’s transparency is highly intentional: B+H and McCallum Sather developed the Joyce Centre to be a “living lab.” The ultimate purpose of the building is twofold: it’s meant to make students cognizant of their energy and carbon footprint, but it’s also meant to instruct them on how to operate – and eventually develop – the net zero buildings of tomorrow. 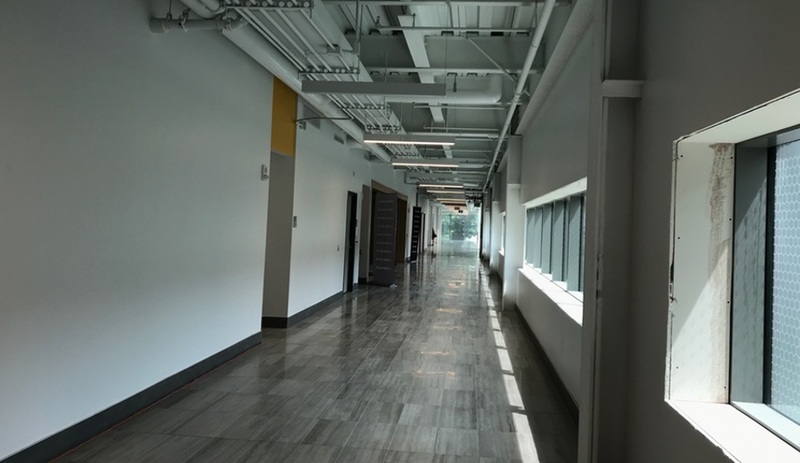 That’s a lofty goal, but to start, the university is rolling out Zero Carbon Ambassador programs, meant to introduce the building’s functionality and features to peers. 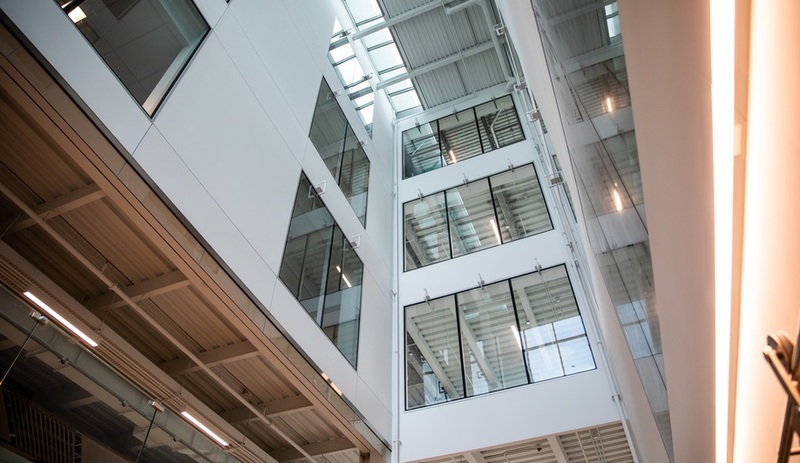 “We want to help students understand the choices that were made in designing this building and how their behaviour impacts its operation,” says Kate Flynn, Mohawk’s manager of climate sustainability and climate change.